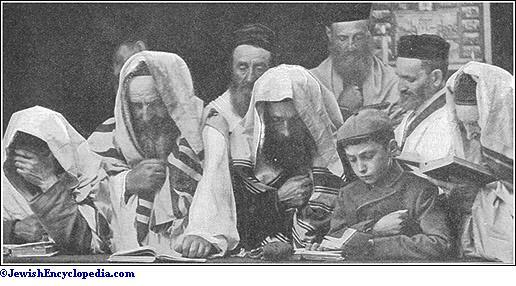 ATONEMENT, DAY OF ( , Yom ha-Kippurim). 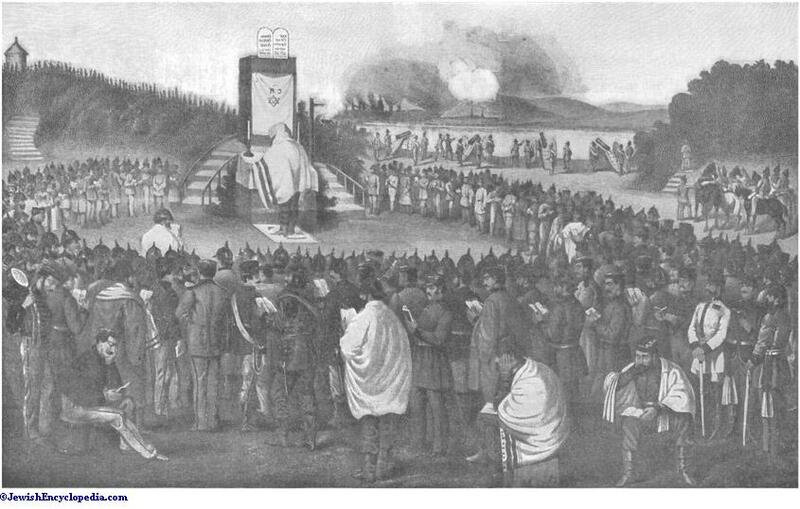 The term , "Yom Kippur," is late rabbinic. The Biblical laws relating to it are found in Lev. xvi. (ceremonies); ib. xxiii. 26-32 (list of holidays); ib. xxv. 9 (ushering in the jubilee); Num. xxix. 7-11 (sacrifices). All depends on whether a man's merits outweigh the demerits put to his account (Maimonides, "Yad," Teshubah, iii. 3). It is therefore desirable to multiply good deeds before the final account on the Day of Atonement (ib. iii. 4). Those that are found worthy are entered in the Book of Life (Ex. xxxii. 32; Isa. iv. 3; Ps. lxix. 29 [A. V. 28]; Dan. xii. 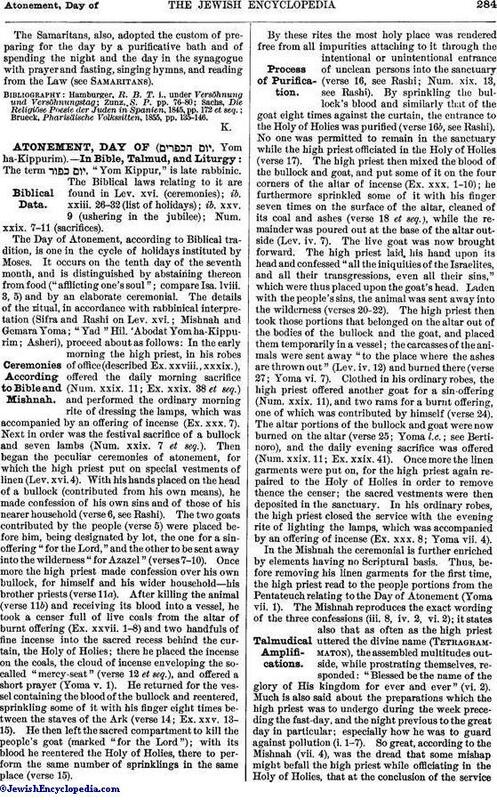 1; see Charles, "Book of Enoch," pp. 131-133). Hence the prayer: "Enter us in the Book of Life" ( , "inscribe us"; but , "seal us," that is, "seal our fate"—in the closing prayer on the Day of Atonement). Hence also the formula of salutation on New-Year's Eve: "May you be inscribed [in the Book of Life] for a happy year." In letters written between New-Year and the Day of Atonement, the writer usually concludes by wishing the recipient that God may seal his fate for happiness ( ). 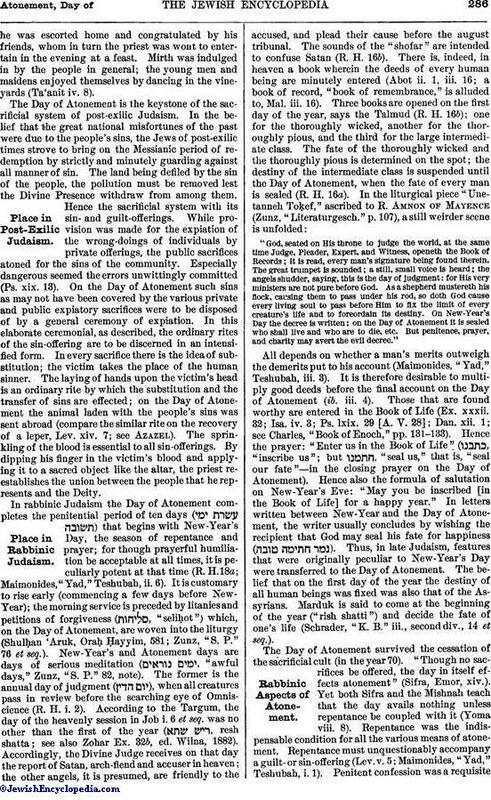 Thus, in late Judaism, features that were originally peculiar to New-Year's Day were transferred to the Day of Atonement. 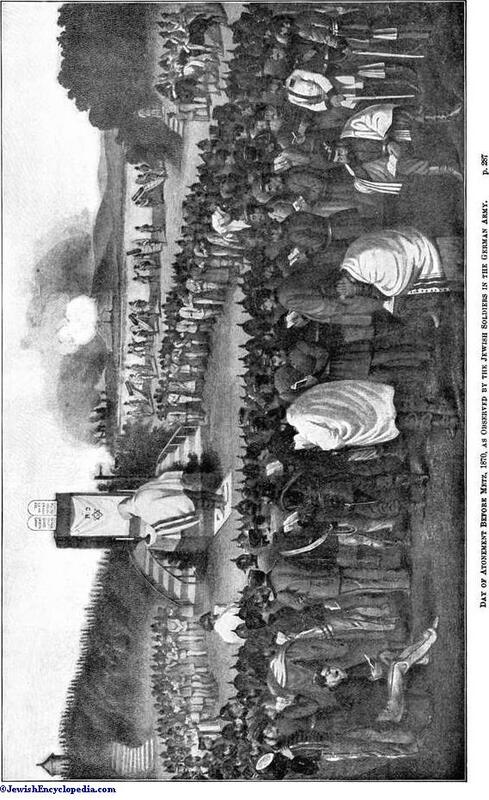 The belief that on the first day of the year the destiny of all human beings was fixed was also that of the Assyrians. Marduk is said to come at the beginning of the year ("rish shatti") and decide the fate of one's life (Schrader, "K. B." iii., second div., 14 et seq.). The service in the synagogue opens in the evening with the Kol Nidre. The devotions during the day are continuous from morning until evening. 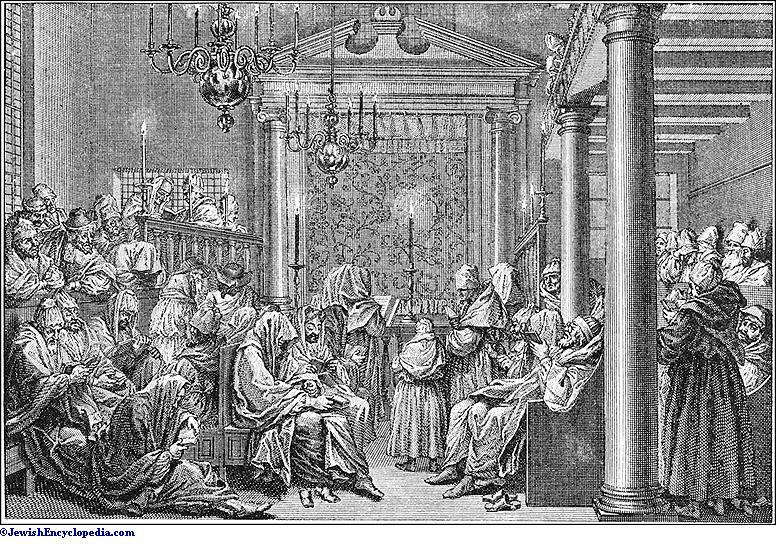 Much prominence is given to the liturgical pieces in which the Temple ceremonial is recounted ('Abodah service; Zunz, "Literaturgesch." pp. 27 et seq., 64 et seq.). 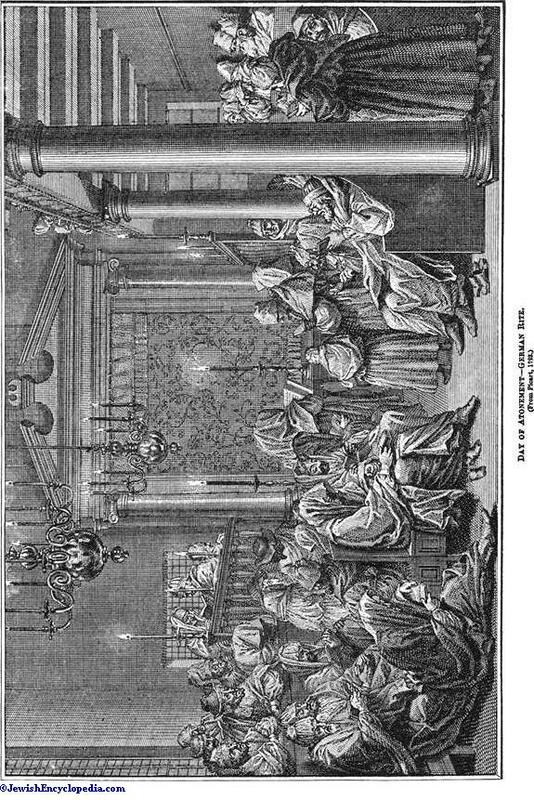 Ibn Gabirol's ("Crown of Royalty") skilfully deals with the problem of sin: it is appended to the Sephardic liturgy for the evening service, and is also read by the more devout in the Ashkenazic synagogues. In the center of the older liturgy is the confession of sins. "For we are not so bold of face and stiff-necked as to say to Thee, We are righteous and have not sinned; but, of a truth, we are sinners. . . . May it be Thy will that I sin no more; be pleased to purge away my past sins, according to Thy great mercy, only not through severe chastisements." The traditional melodies with their plaintive tones endeavor to give expression alike to the individual's awe before the uncertainties of fate and to a people's moan for its departed glories. On the Day of Atonement the pious Jew becomes forgetful of the flesh and its wants, and, banishing hatred, ill-feeling, and all ignoble thoughts, seeks to be occupied exclusively with things spiritual. However rigorously the rabbinical law may insist on the outward manifestation of contrition, the corrective is provided for in the lessons from the Prophets (Isa. lviii. 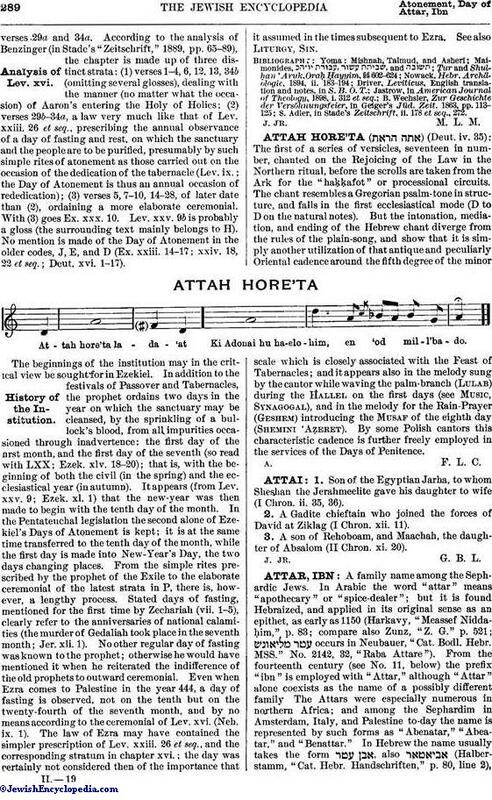 ; Jonah; see Ta'anit ii. 1), which teach that the true fast-day in which God delights is a spirit of devotion, kindliness, and penitence. The serious character impressed upon the day from the time of its institution has been preserved to the present day. 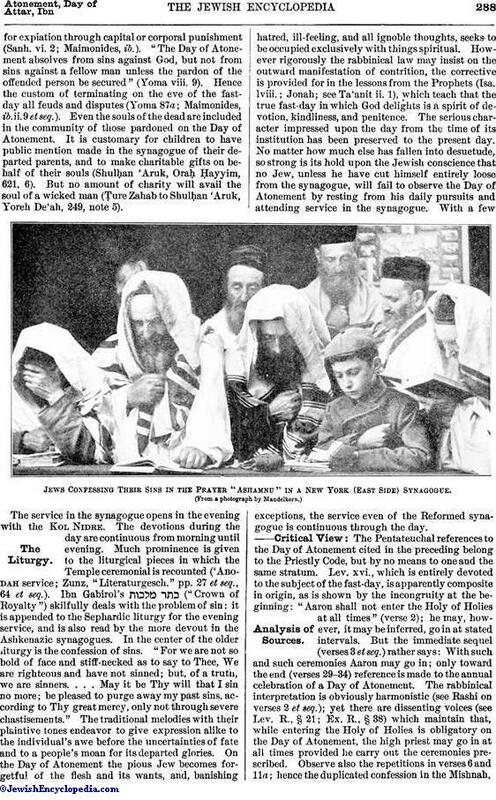 No matter how much else has fallen into desuetude, so strong is its hold upon the Jewish conscience that no Jew, unless he have cut himself entirely loose from the synagogue, will fail to observe the Day of Atonement by resting from his daily pursuits and attending service in the synagogue. With a few exceptions, the service even of the Reformed synagogue is continuous through the day.